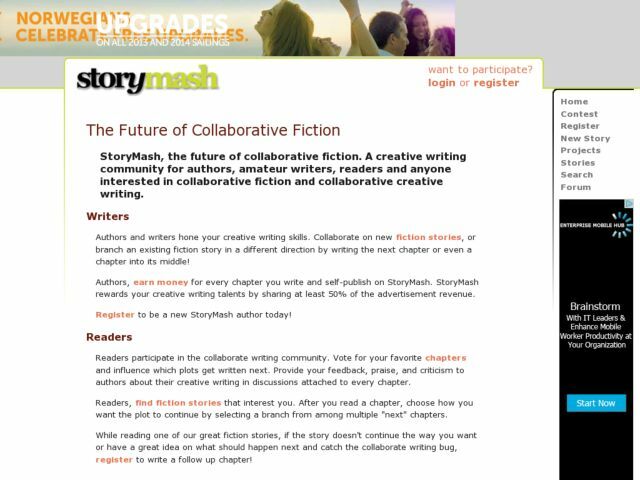 StoryMash.com, where the future of fiction is being written... by you! StoryMash is an exciting new way to create collaborative fiction. And every author can get PAID. You earn a share (over 50%) of ALL revenue by posting chapters, short bits of fiction, analogous to chapters in a book. Each chapter starts a new story or continues an existing one. If you want to take a story in a different direction, you can! Readers provide feedback via comments attached to each chapter and more importantly by rating each chapter on 1-5 scale. Thus the best liked chapters assemble into an ever-growing story and, before you know it, a great work of fiction is born! The rapid and continuing development would not have been as easy without the power of Django and Python, thanks!